The Phyllis Wheatley Elementary School in New Orleans looks like no other school anywhere else. 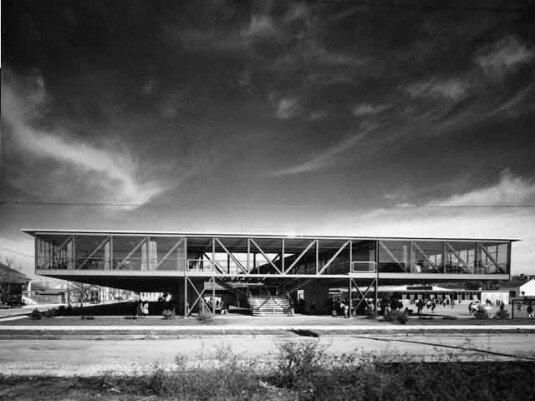 Designed and built in 1955 by the architect Charles Colbert specifically for the historic African-American neighborhood of Tremé/Lafitte, the now-decrepit modernist glass box appears to float above the ground. Colbert managed to set back the columns needed to hold the building above flooding levels, creating dramatically cantilevered class rooms and an empty common area for the kids underneath. Huge windows let in plenty of sunlight, and kept the building surprisingly cool in hot and humid New Orleans. The building was celebrated for these features at the time, but fifty years of neglect and a hurricane have taken their toll. In July last year, the Recovery School District (RSD)—which works to rehabilitate underperforming schools in Louisiana—finally decided to tear the dysfunctional building down, and build a new school in its place by 2013.